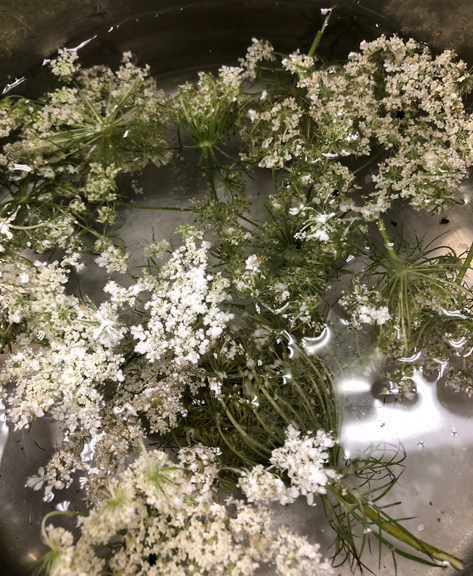 While foraging, I looked for Queen Anne’s lace, rumored to make a golden-cream colored dye. I hadn’t much luck, except for a faint stain. I think many flowers are required, which is always true with plant dyeing — more plant matter, richer dye application. Bucknell University Biology Professor Mark Spiro taught me that the one odd black- or purple-colored flower central to all the white florets is part of the plant, and not a bug I thought I had to remove. This central dark floret helps distinguish the plant from poison hemlock and other look-alike plants. Queen Anne’s lace grows wild in cracks in the sidewalk here in Brooklyn and between fences and sidewalks. Although considered a weed, it has many uses, appearing in wild and cultivated bouquets.